This is the first of three events in the new Adventure Guide presents Run Pure & Simple series: running events with all the essentials and no bells and whistles. You get a great course, timing, water and an awesome atmosphere. This is the second running of this race. It's an urban course in the core of Waterloo Region. Your GPS might lose reception among the tall buildings but the pavement you're pounding is still a certified mile! Discover Your Outdoors this year! All Adventure Guide presents Run Pure & Simple events, including this one, are free to Run Waterloo members. Click Become a Member to the right to learn more. Adventure Guide presents Run Pure + Simple is a series of three events designed to get you outdoors and racing without breaking the bank. Mail in: To 2 Weberlyn Crescent, Conestogo N0B 1N0 by Tuesday July 18 at 5:00 p.m.
Drop off: At Runners’ Choice, 55 Erb St E, Waterloo by Tuesday July 18 at 5:00 p.m.
Online: Right here at www.RaceRoster.com by Wednesday July 19 at 11:59 p.m.
Will take place at the Carl Zehr Square, 200 King St W, Kitchener, ON N2G 4V6 from 8:00 a.m. - 9:00 a.m. If you aren't planning to take public or active transportation to get downtown, check out the City of Kitchener's parking map. The garage at Charles/Benton is free on Sundays, and it is about a 500m walk to Carl Zehr Square. 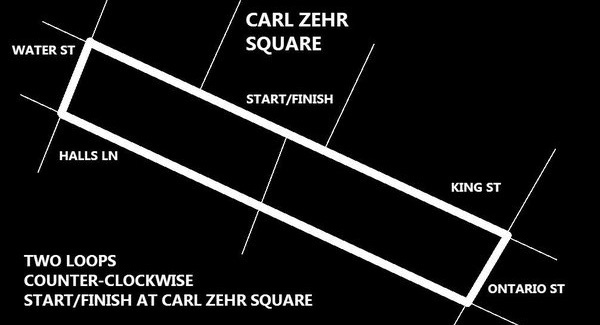 A 2-loop certified mile distance through the downtown streets of Kitchener.